This economical 3 in 1 egg slicer is perfect for light use at your restaurant, cafe, bistro, or deli. Are you manually slicing eggs to top salads or garnish plates? 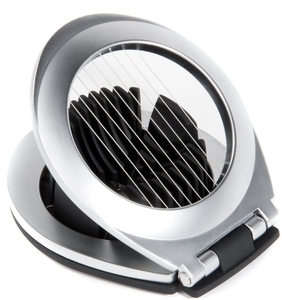 Save time and labor by adding this egg slicer to your collection of kitchen tools! Designed to cut round or oval slices and even provide egg wedges for caesar salads, this egg slicer is perfect for light-duty use in your cafe or kiosk.